Another Korean War Unknown soldier has been identified….. The remains of an Ohio soldier killed during the Korean War have been identified. Officials say the 21-year-old soldier was reported killed fighting against the Chinese People’s Volunteer Forces at Turtle Head’s Bend, near the village of Unsan, North Korea, on Nov. 2, 1950. He was buried at a United Nations cemetery that was soon closed as the situation in North Korea worsened. May the family of Cpl. Nemec find the closure they have long been denied and may Cpl. Nemec Rest In Peace. US Congressman Walter Jones from North Carolina died…..this man voted for voted for the Iraq War and then spent the rest of his life atoning for that ill-conceived vote…..
Rep. Walter B. Jones Jr., an Eastern North Carolina congressman who made it his mission to atone for his vote sending U.S. troops into Iraq in the early 2000s, died Sunday on his 76th birthday. Jones, like his father, served his district for nearly a quarter-century. IST send our condolences to his friends and family…..he will be missed….may he Rest in Peace. And again an outpouring of respect for the “Unclaimed” veteran…..
Bless the people that showed such respect….for NO veteran should be buries without people in attendance. I was derelict in my duty over the last few days…..I try to give our troops and veterans all the respect they deserve….sad to say that from time to time I miss a chance to tell their story…..as it was over the days after Christmas that I decided to take a “few days”…..
A family member says the nation’s oldest World War II veteran, who was also believed to be oldest living man in the US, has died in Texas. Richard Overton was 112. Shirley Overton, whose husband was Richard’s cousin, says the Army veteran died Thursday evening at a rehab facility in Austin, the AP reports. Overton had been recently hospitalized with pneumonia. Overton was in his 30s when he volunteered for the Army and was at Pearl Harbor just after the Japanese attack in 1941. He once said that one secret to his long life was smoking cigars and drinking whiskey, which he often was found doing on the porch of his Austin home. In 2013, he was honored by former President Obama at a Veterans Day ceremony at Arlington National Cemetery. I apologize that I missed his passing and did not post an obit……our greatest generation is slowly dying off…soon they will be all gone and the next will be the Korean War many of whom were fighting in WW2….then my generation will be the ones that they talk about….probably not lovingly. Mr. Overton….Thank you for your service to your country……May you Rest In Peace. Yet another US trooper was killed in Afghanistan…..this death is of a US Ranger…..
A recent clash in Afghanistan resulted in the death of a U.S. soldier and an Army Ranger dog. Sgt. Leandro A.S. Jasso, whose death was previously reported, died in a raid against al Qaeda militants that in the southern Nimruz province in late November. The other casualty was that of Maiko, an Army Ranger dog. Stars and Stripes on Tuesday reported that Maiko had been assigned to the 75th Ranger Regiment’s 2nd Battalion. “The actions of Maiko directly saved the life of his handler … and other Rangers,” according to a biography of the dog confirmed to Stars and Stripes by a spokesperson for the 75th Ranger Regiment at Fort Benning in Georgia. Maiko was born in 2011 in the Netherlands and arrived in the U.S. a year-and-a-half later. The dog was on his sixth deployment to Afghanistan and was 7 years old when the clash occurred, according to Stars and Stripes. Maiko reportedly participated in more than 50 Ranger-led raids involving combatant apprehension, building clearance and improvised explosive device detection. IST wishes to thank this brave trooper for his service and that he may Rest In Peace…..his sacrifice will never be forgotten. Over this past weekend this country lost a president……POTUS 41…..George HW Bush died at age 94….. I admit I was never a supporter of his……I worked against him in his run against Clinton but to be fair I worked in opposition to Clinton as well…..but from an international relations point of view Bush1 was a good president…..as the 41st president he oversaw the end of the Cold War and the beginning of a uni-polar world…..he went to war on several occasions that I opposed……and worked hard to stop the wars …. Richard Haass wrote a good piece about Bush1’s chops as president….. I worked for and often with Bush for all four years of his presidency. I was the National Security Council member responsible for overseeing the development and execution of policy for the Middle East, the Persian Gulf, Afghanistan, India and Pakistan. I was also brought into a good many other policy deliberations. And so passes George Herbert Walker Bush, the last American President to face combat. Following the attack on Pearl Harbor that drew the United States into World War II, he deferred admission to Yale and joined the Navy at the age of 18, just out of prep school in the June of 1942. He went to war in 1943, barely a man, saying later, “I was scared but I was willing. I was young, but I was ready. I had barely started living when I began to see men die.” He saw significant combat across the Pacific as a carrier-based bomber pilot, serving with deep courage and commitment, completing 58 combat missions and surviving two crashes. But my memories are not all glowing…..I feel that under his leadership the GOP was handed over to the Religious Right which had the beginnings of the world we have today. He also was a better president….he called supply side economics its better name voodoo economics….we can give him the win for the Cold War and he did what needed doing at the time raised taxes (that was the kiss of death for the rich donors) and he looked for a balance between the branches….. I may not have wanted this person to be re-elected but I did appreciate what he was attempting to do as far as foreign policy goes….not much I would have supported but could understand. But at least it threw Trump off the headlines and I bet he has had a sigh of relief for that. 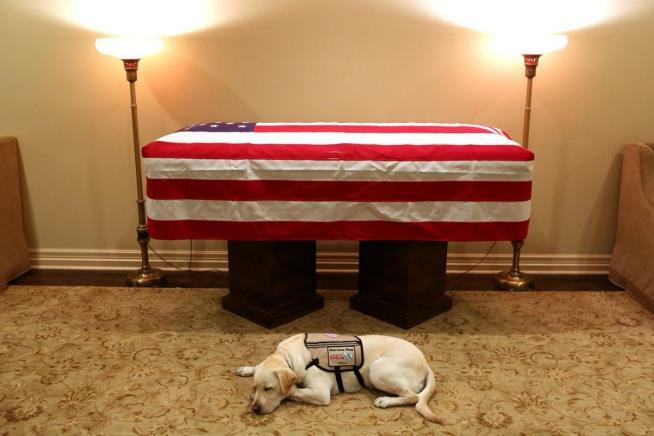 Sully, HW’s service dog bids farewell.